I’m surprised to note I’ve posted only a little about my new vegetable garden. Granted, we’ve had a lot going on since we moved to Waterloo in March, so it’s easy for things to slip by. One of my challenges was to figure out how to grow food in limited space, and I’m pleased to report things are going swimmingly. Here’s a more in depth post about what’s happening outside our living room window. The above photo of my square-foot garden was taken two weeks ago. I learned how to set it up from some online videos. The frame is untreated cedar. I filled it with commercial potting soil enriched with compost from the worm composter. Here it is when newly established in early April. 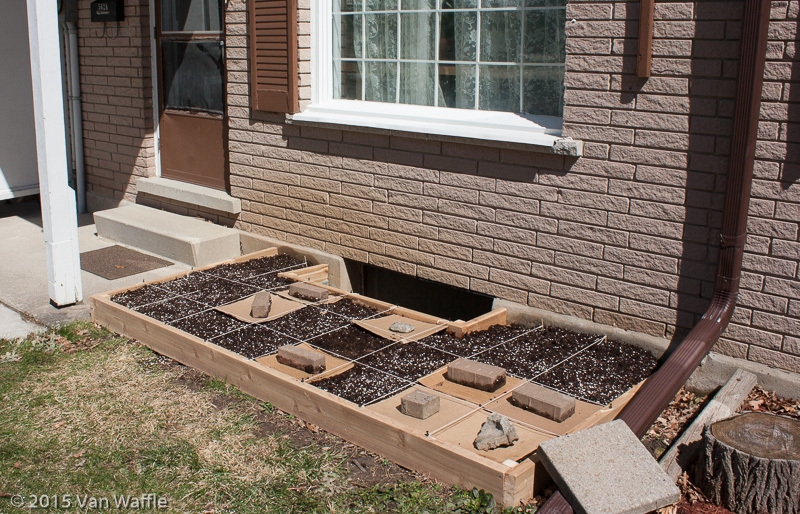 The ideal size for a square foot garden is four by four. This one is four squares deep and eight wide, with a keyhole for the basement window well. I’ve also filled two squares with stepping stones allowing easier access to the back rows. I covered the newly sown seeds with cardboard to maintain even moisture and warm the soil. This strategy is useful for the cabbage family (kale, Brussels sprouts, broccoli and kohlrabi) that requires even moisture to germinate well. However, it didn’t work for everything, as I would soon learn. We received a cold snap with persistent snow in late April. This had no negative impact on kale, spinach or arugula. Germination was poorer for lettuce, carrots, calendulas and magenta spreen. I don’t know whether they objected to the cold, but I think lettuce and spreen seeds may be light activated so the cardboard would have inhibited them. Later I added more seeds without covering and now they’re coming along fine. I’m growing additional crops in containers. The barrels contain bush beans, zucchini and acorn squash. 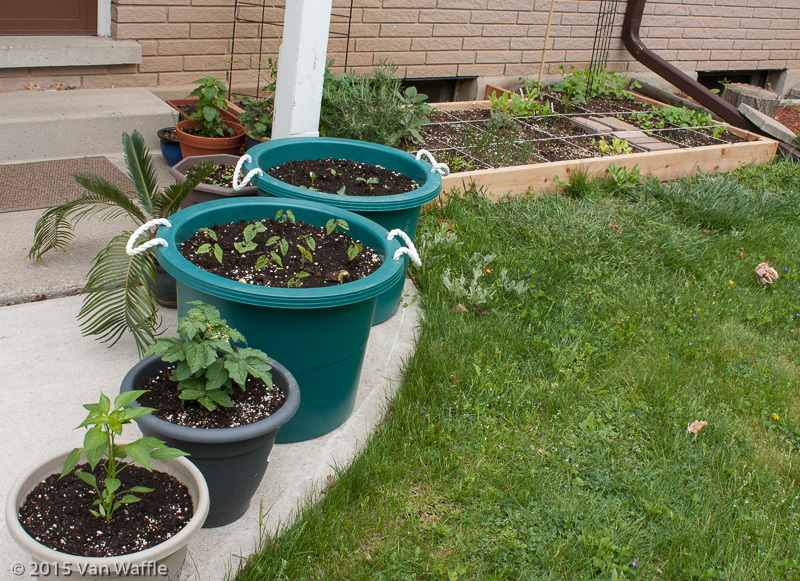 Pots provide room for extra tomatoes, peppers and a variety of herbs. Having them in containers also allows an earlier start for frost-tender vegetables (beans, tomatoes, peppers and squash, among others) because they can move indoors in case of a cold night. Here they are May 12. Our official last frost date is May 17. Warm weather in May brought things along quickly. Unfortunately it has been interspersed with surprise late frost, with a fairly hard frost on May 26, which may have spelled disaster for nut and fruit crops. The bush beans in the barrel took a little bronzing on their leaves one night when I was careless, but they were indoors on May 26 and have quickly recovered. Tomatoes and beans planted early against the foundation of the house came through the cold weather unscathed. I first grew an herb called rocket when I was a kid. I’d read about it in British gardening books, but it was unfamiliar to my family’s palette. Apparently most North Americans responded the same way because it never gained popularity here. Someone renamed it arugula and reintroduced it a few years later. Now it’s popular. Maybe people are more receptive to healthy salad greens now than in the ’70s. This year one single square foot of garden produced almost more arugula than I knew what to do with. I’ve never been particularly fond of bitter greens, but like anything plucked fresh from the garden, this arugula is different altogether, succulent and delectable. A little lemon juice, lemon zest and olive oil dresses it up nicely. Here’s that abundance of arugula threatening to crowd out the calendulas and rhubarb chard, with healthy peas climbing in the background. We’ve also had plenty of spinach from two squares planted several weeks apart, but the second batch maturing in May’s heat was less productive. 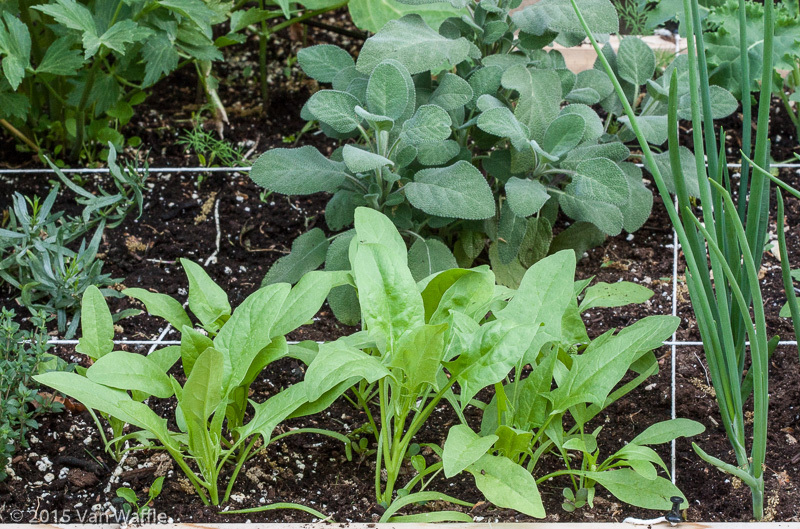 The moral: plant your spinach as soon as the ground can be worked (for best results, soak seeds for 24 hours first). I had a head start because I was establishing a new garden and planting directly into a purchased mix. I prefer to nurture my own soil, but this was a one-time investment. Here’s the second crop surrounded by thyme, tarragon, lovage, sage and onions. With warm weather, the spinach and arugula were beginning to bolt, so I cut all the remaining plants yesterday. Succession crops of kale and bush beans went into the vacant squares. 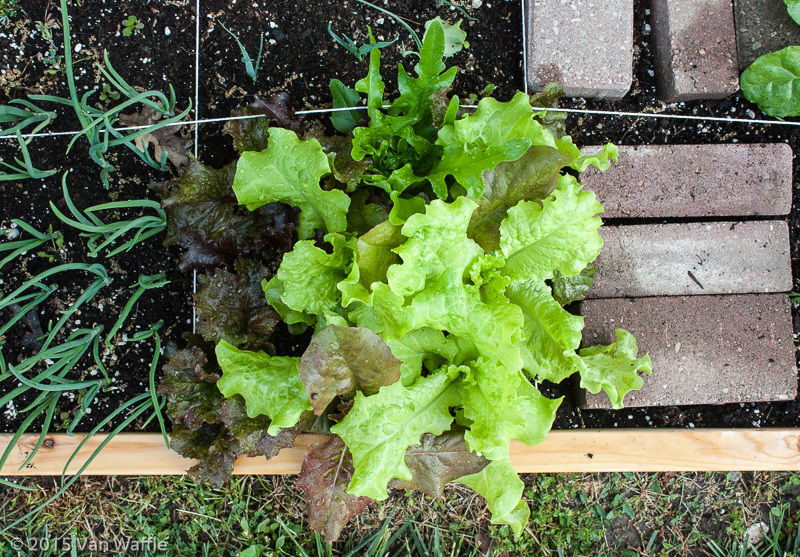 Next up to the plate is this gorgeous selection of leaf lettuce. I haven’t even touched it yet, we’ve had so many other salad greens available this spring. I have more lettuce seedlings coming along in a pot, which I can move to shade to keep it nice through the inevitable hot weather ahead. 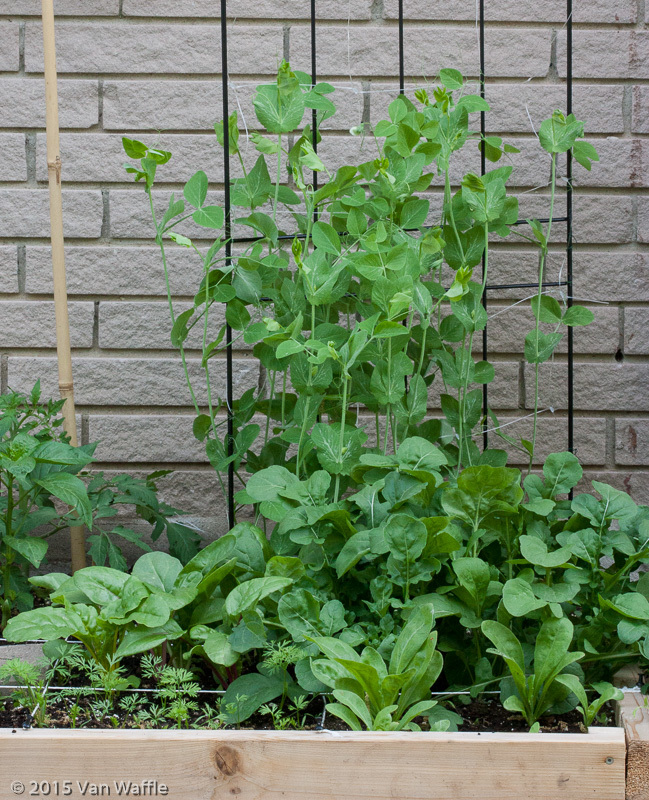 This square foot garden is a delight to the eye as well as the palate. I can’t count the number of times new neighbours have complimented it while I’m working there first thing in the morning. Looks awesome and thanks for the planting tips…I’m contemplating re-establishing our (long abandoned) garden plot at the back of our lot. Our major issue was animals eating the vegetation (particularly rabbits). We back out onto a green space and there are plenty of bunnies in “them thar woods!” We had to put up chicken wire to keep them out, which also made it more difficult to maneuver within the garden to weed and water. I can appreciate your frustration because I’ve had problems with groundhogs at past gardens. They’re even more destructive than rabbits. Part of my solution was choosing vegetables they don’t have a taste for, especially tomatoes, potatoes and peppers. They’re not my favourites, but given enough space you can grow a year’s supply of potatoes. Groundhogs and squirrels will sometimes eat ripe tomatoes, but if you grow vining types pests won’t be able to reach the ones higher up. Unfortunately it isn’t good to grow these vegetables (members of the nightshade family) on the same soil year after year because they’ll get diseased. At our last place I tried alternating them with squash. Animals will sometimes nibble them, but once the plants are established they grow so vigorously that it doesn’t matter. Most herbs will not attract attention. 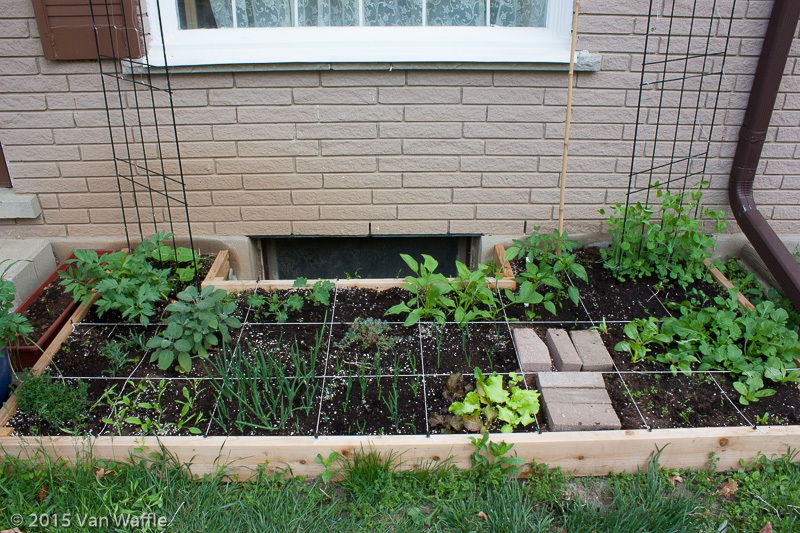 I’ve seen some interesting raised bed designs that also incorporate protective fences. This might be a good strategy for your yard. The beauty of a square-foot garden is that you can get tremendous productivity out of limited space. So you can concentrate your efforts and finances on building one or two four-by-four raised beds for starters and see how that works. I have a friend in Guelph who uses this strategy very effectively to address the rabbit problem. Wah, I miss having a garden, but alas I have not the space or the light here. There *is* a community garden at uni, I have recently discovered, and I may look into that. At the very least I’ve discovered they accept compost donations so I can finally get back to composting my veggie scraps. Home-grown rocket is a delight! The flowers are edible too, so you get something pretty for your salads once it’s bolted, and if you leave it to seed you will have rocket forever. When I saw my old garden in January the rocket was still going strong after 14 months of neglect (the rhubarb was a trifid! Clearly the new tenants don’t know what it is or how to harvest & prepare it. So sad.). Beautiful garden Van, thank you for sharing it. Thanks for the rocket tip. I left one bolted rocket plant to go to seed and it’s flowering now.